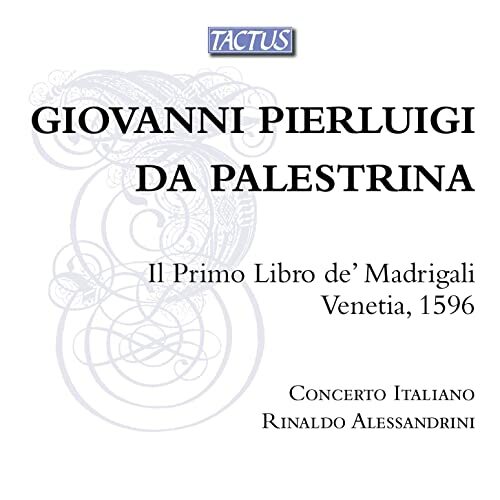 I. Giovanni Pierluigi da Palestrina—Il Primo Libro de’Madrigali Venetia, 1596 (Concerto Italiano/Rinaldo Alessandrini). Tactus CD TB 521604. The Primo Libro di Madrigali a quatro voci was, chronologically speaking, the second work that Giovanni Pierluigi da Palestrina published. It was printed in 1555 in Rome by the publishers and printers Valerio and Luigi Dorico. On the title page the composer refers to himself as «Cantore nella Cappella di N[ostro] S[ignore] », a title which in Rome at that time represented the highest position to which a musician might aspire. Pierluigi’s appointment as cantore pontificio officially took place on 13 January 1555 following the explicit wishes of Pope Giulio III, his benefactor. «absque ulo [síc] examine [ ... ] et absque consensu cantorum ... »: the pontiff had thus imposed this decision upon the Collegio dei cantori, disregarding the rules set down by the Constitutiones of the chapel and overriding the norms which he himself had established in the Motu proprio of 5 August 1553. The precise date of publication of this work is unknown, but the information on the title page, as well as a series of events which took place in the first half of that year, allow us to restrict the period. II. Vincenzo Capirola-Non ti sciacqua l’ascoltar…Lute Works 1517 (Paolo Cherici). Tactus CD TC 470301. This CD is dedicated to Vincenzo Capirola (1474 - ca. 1550). It is intended both as a tribute and as a testimony: a tribute to one of the most important composers of the Italian early sixteeth century instrumental music; a testimony to the transformations that the music language brings to completion in one of the most extraordinary and rich periods in history of music. Actually, in the very first decades of the century composers begin to write and publish specific instrumental pieces. As a consequence, instrumental music starts to emerge from the shadows of the medieval period. This new attention to instruments (such as organ, viola, harpsichord and particularly lute) produces a creative flurry of new forms and languages which will characterize all the following instrumental music. Vincenzo Capirola plays a leading role in this flourishing phase of instrumental repertoire thanks to his manuscript dating back to 1517 containing dances, ricercars and transcriptions of vocal pieces of contemporary polyphonists. His writing has a strong originality, especially in his ricercars which have an amazing breadth of composition in the alternation of conflicting moments (such as fast virtuoso scales and slow calm chord successions). Besides, his manuscript is richly decorated giving an additional value from an aesthetic point of view. Thus, in these pages we find a marriage of painting and music according to the Renaissance conception which cultivates and pursues the unity of arts. Lutenist and vihuelist Paolo Cherici has recorded 22 works for lute by Vincenzo Capriola, as collected by Capriola’s student, Vidal. The music consists of dance forms, lute arrangements of other composers’ works, ricecari, and intabulations of polyphonic vocal music, both sacred and secular. The ricecari, with their emphasis on improvisational skill, are of particular interest as they give the listener the chance to compare and contrast the respective tones of the lute and its guitar-shaped, Spanish cousin, the vihuela. Mr. Cherici’s playing exhibits a sure-handed, masterful virtuosity on both instruments. Equally intriguing is the fact that this project seems to be entirely self-recorded. If so, Mr. Cherici also deserves high praise for his efforts as a recording engineer/producer; the sound he achieves is pristine and clear, yet warmly intimate. A welcome addition to the ever growing body of new recordings of ancient music, “Vincenzo Capriola – Lute Works” by Paolo Cherici should be on the must-have list of Renaissance music fans, guitar students, and any member of the general public curious about the earliest roots of instrumental music. Their reward will be an enjoyable and genuinely beautiful listening experience. Highest possible recommendation--10 out of 10-- Oscar O. Veterano. III. Andrea Gabrieli—Messa bassa a San Marco (I Cantori di San Marco/Marco Gemmani). Tactus CDTC 530701. While during most of the sixteenth century vocal polyphonic music had steadily focused on a four-part structure, around the fifteen-seventies the number of parts underwent a remarkable increase, particularly in sacred music, all over Italy. In 1560 a six-part composition was still regarded as an unusual piece for special occasions, but in 1580 this number of parts was considered not very high, since in the most important festivities, music formed of eight or more parts was performed, and, particularly in Venice at the end of the century, pieces formed of no less than twenty or more parts were composed. A typical example of this case is the Concerti published by Giovanni Gabrieli in 1587, one of the cornerstone works of the musical production of the second half of the sixteenth century: many Italian and foreign composers admitted that they had obtained new ideas from this work, where the six- and seven-part pieces appeared to be the most “simple” ones, while the ten-, twelve- and sixteen-part pieces were predominant. The four-part structure, which had been customary up to a few years before, seemed to be obsolete by then. The structure of these polyvocal, often also polychoral, pieces, is not particularly complex. Their appeal consists chiefly in the pursuit of grandeur, the dynamic play of the choral masses, the restless rhythm of the sequences of chords, and the search for a sound that is rich in harmonics. Andrea Gabrieli, Vincenzo Capirola (1474 - ca. 1550), Giovanni Pierluigi da Palestrina.